We have contemplated with considerable satisfaction the various attempts to take human life during the present week. Our joy at the mutilation of old Hulton has been deeply unspeakable; our lively interest in the shooting and hacking of and by the Dudleys, Ingham, and Miller has been testified in a novel and interesting manner by a private scalp dance at our own apartments. Within a certain limit, we have a fondness for this sort of thing; the line at which it should stop being drawn quite close to our own person, but not embracing it. Within that boundary, homicide is honorable and mutilation proportionately commendable. The savor of smoking blood is peculiarly appetizing, and the dulcet note of the pistol is soothing to the senses—while the sight of reeking corpses scattered at intervals along the sidewalks is mildly exhilarating. It pleasantly reminds us of the time when we were a soldier, with a soldier’s simple taste—a warrior, with a warrior’s hopes and fears—the latter in excess. Let the good work go on—within the limits aforementioned. 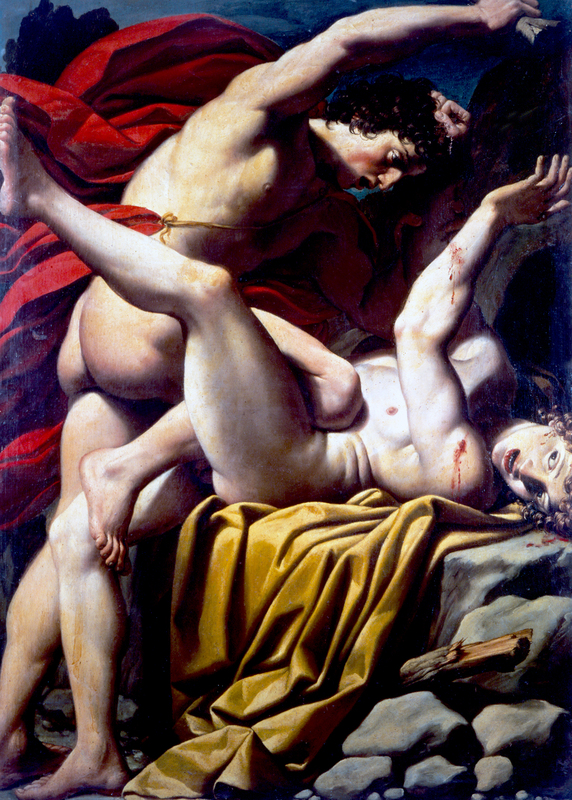 Cain Slaying Abel, by Leonello Spada, c. 1610. Give the pacific devil his occidental due. We are liars, but we shoot and stab with inimitable skill; we are braggarts, but we know how to bring down our man. Our country is a melancholy enough affair, with no “objects of interest to the tourist.” Yosemite is a conceded fiction, and the Big Trees a screaming joke; the purely imaginary excellences of the finest climate in the world, sir, we no longer parade; upon the subject of our agricultural greatness and commercial importance we back squarely down. But we are handy with the pistol and wield a butcher knife as deftly as an Indian or anybody. Our proud preeminence in these particulars we have attested with tolerable completeness. So long as we maintain a spotless reputation as blackguards, what is the use of knowing anything? From a newspaper column published in the San Francisco News Letter and California Advertiser. Having fought at the battles of Shiloh and Chickamauga in the Civil War, Bierce moved to San Francisco in 1866 and began writing his trademark satires. In 1906 he published The Devil’s Dictionary in which he defined, among other words, “Egotist” as “A person of low taste, more interested in himself than in me."